Dives have that special flavour that result from the meeting of Atlantic species with subtropical ones. Having dived in the rest of Canaries, I am struck by the diversity of the fish life around Hierro. It surpasses anything I have seen in the Canaries. The marine reserve and the absence of large-scale fishing around the island has something to do with it. But it is also due to Hierro’s greater distance from the colder up welling found off the African coast. As a warm Caribbean current encircles the island, the water here is warmer than off the eastern islands of Fuerteventura and Lanzarote. It is June and the water is 24 degrees! I soon learn to distinguish between chucos and ratones, I mean eagle rays and stingrays. We have come across all manners of rays: electric rays, eagle rays, stingrays and the stunning butterfly ray with a wingspan of over 2 metres, one of the trademarks of Hierro. Antonio, my dive guide, tells me that Maromas (Manta rays) are also regularly spotted about the local dive sites. I put this down to a bit of Spanish blarney. But, back at the centre, a glance at the many photographs taken locally tell the story of their regular sightings. They even have a video of their last sighting filmed around the site of El Bajon. And the list doesn’t just end here. Last month, a whale shark was spotted further off the coast and photographed by local divers. In the absence of a continental shelf, deep waters are found very close to the shore. And it is not uncommon to encounter dolphin and pilot whales on your way to a dive site. In the case of El Bajon, the most popular dive spot, the shore is within swimming distance. 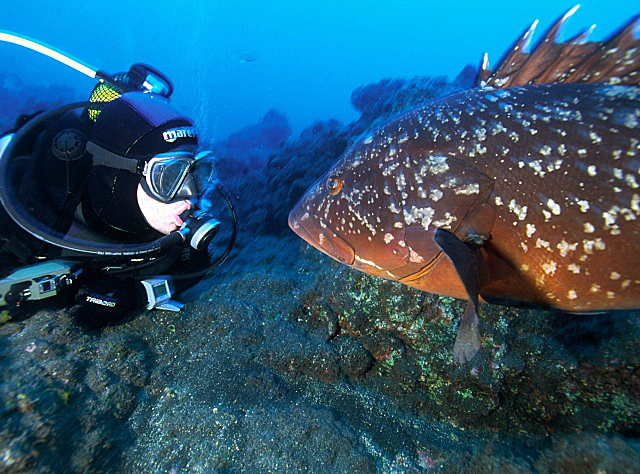 A steep double-humped pinnacle, El Bajon combines spectacular scenery and fish life. 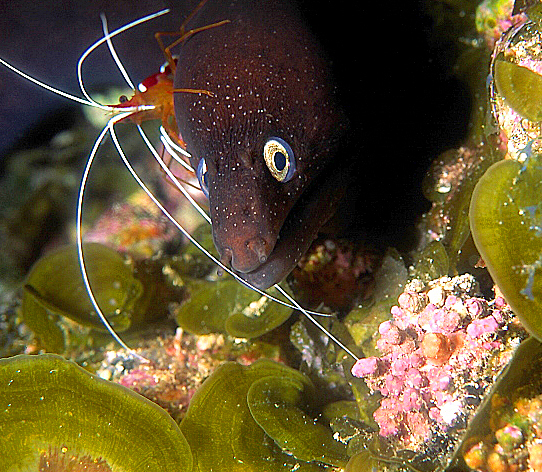 Oceanic currents ensure a constant supply of nutrients and a regular supply of visitors such as barracudas, bonitos, triggerfish, amber jacks, etc. I find myself drawn back to this site during my stay, which is less than ten minutes by RIB from the harbour. The temptation to go deeper in 30 m visibility is hard to resist... And if you want depth, El Bajon has plenty of it with maximum depths down to 70 metres! The saddle part in 10-15 metres is full of action and great for fish life. The place teems with a great variety of fish, from large pelagics to the shy Canarian lobster. 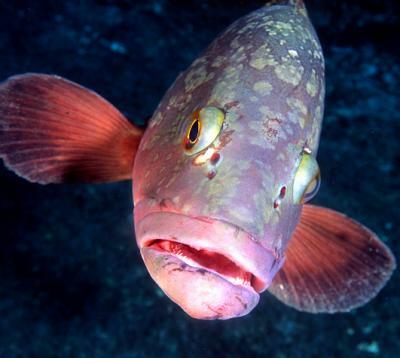 One of its highlights is the swarms of bright ornate wrasse spawning en masse. If you want action and exciting photo opportunities, look no further, El Bajon has it all, strong currents included. The cliff-like walls of the pinnacle offer protection for a safety stop. In between dives, I decide to check the harbour after talking to Antonio. I slip off the moored RIB while everybody heads for lunch. 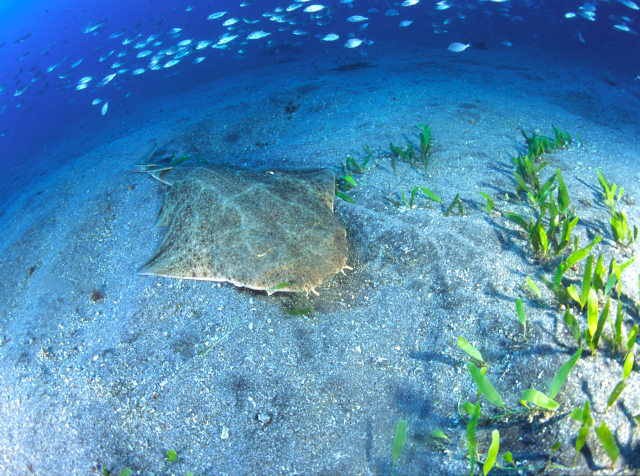 As I make my way to the bottom, the dark sand seems to lift off: a large butterfly ray takes off like a magic carpet. Who says my camera should be turned off when the horizon looks deceptively clear? While I curse my luck, two large stingrays take off in the opposite direction. On another lunch dive, I come across a large nurse shark asleep in the sand. All this, in just eight metres off the harbour mouth, where the rays are known to hide in the dark ripples of the lava sand. Returning to the pier after nearly 80 minutes in the water, I find a turtle within meters of the pier. I’m out of film but not out of luck as a local man tells me that the turtle is always around. Before I know it, I find myself considering another dive in the harbour! The ray saga continues off El Dessierto (the Desert) where we come face to face with an impressive electric ray perfectly camouflaged with its beady eyes peering at us. If it wasn’t for our guide, I would have missed it in spite of its size. On every dive, bright fire worms can been seen crawling on the dark volcanic sand and to say they’re hard to photograph would be the biggest lie of the century. That’s the thing with Hierro, macro or wide-angle, you can find subjects for every lens. For a second, shallower dive, local caves abound this end of the island. This is where the boxfish and tamboril are found hiding in the dark and it takes a torch to ferret them out of their crevices. Some grow to considerable size and inflate their spiny body to scare off their predator. In a local cave, we spot six Canarian lobsters on a ledge and a beautiful pair of red nudibranchs. On the way out of another cave at El Salto, we come across a shoal of trumpet fish, resting motionless in a dense formation, oblivious to our presence. 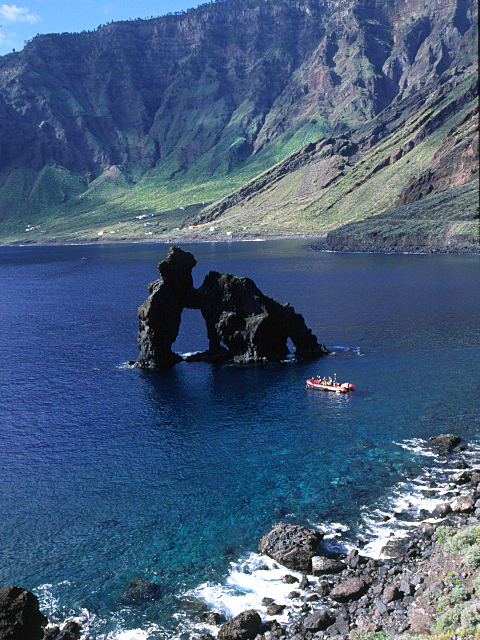 Since 1995 the south tip of the island has be declared a marine reserve by the Spanish government. 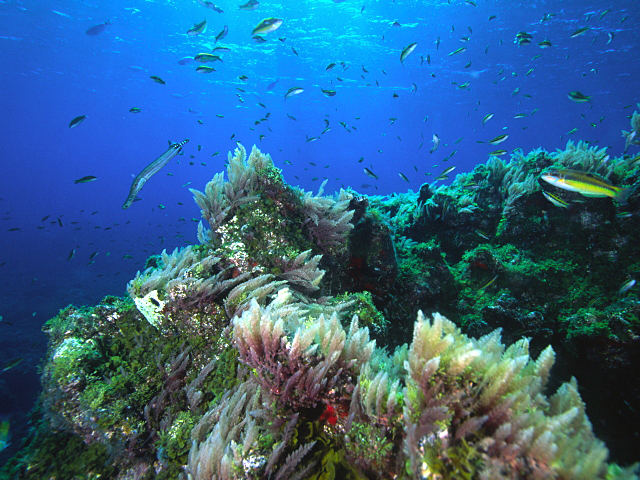 The protected zone runs along an area known locally as Mar de las Calmas (sea of calms). The area runs from the Orchilla lighthouse (historical landmark of the Zero degrees meridian) all the way to the harbour of La Restinga. The whole area is in the lee of the island and offers shelter from the prevailing winds.